The largest tourist area, called Punta Cana, sits on the eastern most tip of the island of Hispanola in the country of the Dominican Republic. 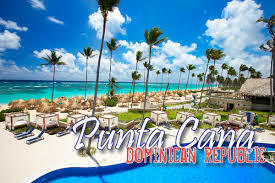 The country of the Dominican Republic has over 10 million residents and their native language is Spanish. However with the influence of the U.S. and extended families residing outside of this tropical paradise, you will find many locals, especially in the tourist areas, can easily assist any visitor in English and many can even speak French, German and Russian. With white sand beaches (30 miles long) and azure ocean waters (where the Atlantic meets the Caribbean Sea), several hotel options, dining and culture, your trip to Punta Cana will be nothing but a dream come true.